As part of our announcement of open sourcing ide-backend, there was a video demonstrating a tool called “fpview” (that was our internal name for this tool). Like many of our tools, after some internal development, we're now releasing it open source here at: stackage-view. Go to definition: You can double-click any identifier to jump straight to the definition. Type information of any expression or pattern binding. Just click any identifier to see its type. Alternatively, you can select an expression to see the type of that. Hitting the <-> expansion button will expand the selection to a parent node. The first purpose behind the tool was to target general teams of people who may not all be using the same tooling (Haskellers are like cats, they prefer to do their own thing! 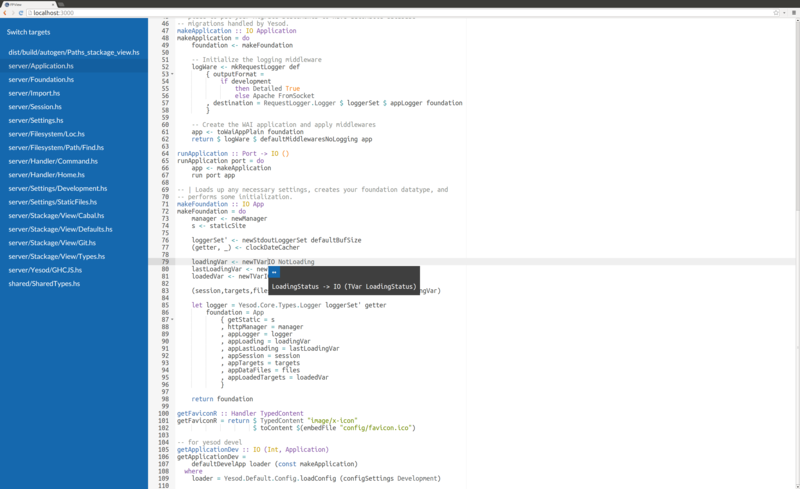 ), some users may be on Emacs, Vim, or Sublime, FP Eclipse, Leksah, etc. whereas this read-only tool serves as a way to inspect a codebase with handy information and jumping available. The second purpose was to serve as a demonstration and acid test for our combination GHCJS and React library ghcjs-react. It makes for a nice simple-but-non-trivial demonstration of the library. There is real-world state handling going on, interacting with third-party APIs (aside from React itself, the Ace editor). It also serves as a demonstration of using ide-backend programmatically. If you look in the source of stackage-view you'll see it's quite straight-forward to use. To build it, you will need the Git version of ide-backend found here. Currently it cannot be uploaded to Hackage due to an issue with the -dynamic flag.